Ultrasonic Cavitation is a known process whereby sound waves disrupt the cell membrane of fat tissue. Radio Frequency further aids in the disruption of the cell membranes of the fat tissue resulting in fat deposits being freed in the body in such a way that these deposits can be eliminated by the body’s natural processes. If we picture the fat cell as an egg, then the eggshell is cracked by the Cavitation procedure, and the RF procedure helps to shatter the already cracked shell. The fat is then flushed out through the functions of the lymph system, kidneys, and intestines, aided by hydration and exercise. Click here for a further detailed explanation of the Cavitation process. Radio Frequency therapy utilizes RF energy in short intense pulses which oscillate through the skin to generate heat in targeted tissue, just below the surface of the skin. This heat generation within the cells stimulates the body’s natural ability to produce new collagen and the contraction of existing collagen fibers, as well as stimulating vascular activity, resulting in smoother, tighter, and firmer skin. Cavitation and vacuum probes aid in the elimination of cellulite in the tissue. 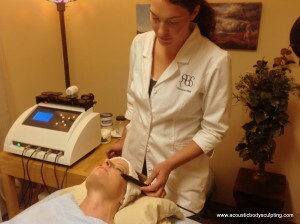 The vacuum portion of this treatment helps to smooth the underlying irregularities of the skin. The Cavitation and RF processes break apart fat cell membranes, then the suction of the vacuum handpiece pulls up subcutaneous fat in the small diameter of the aperture of the handpiece which levels out and smooths all of the underlying tissue. This treatment substantially reduces the appearance of cellulite. The Lymphatic System is what the body uses to eliminate waste products. Techniques for stimulating lymphatic drainage have been developed by medical professionals for years. 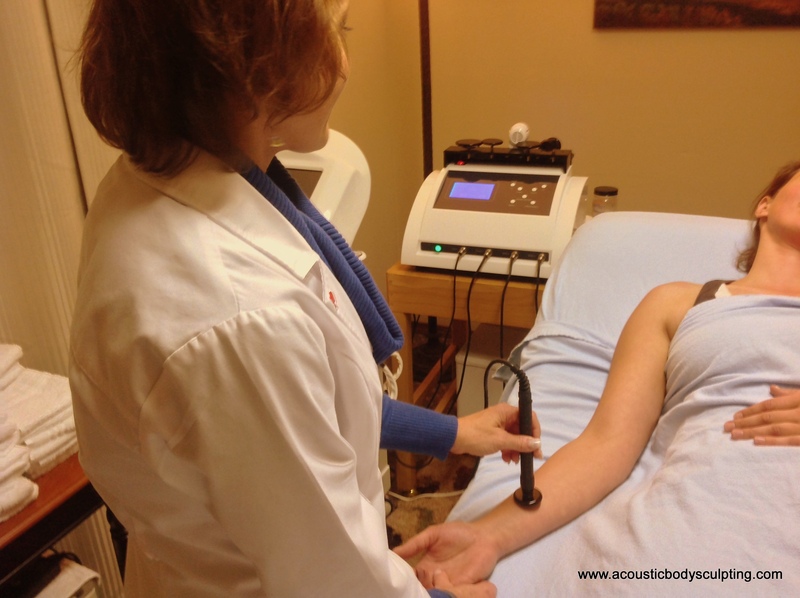 Radio Frequency techniques can be utilized to aid in this process of lymphatic drainage. The Lymphatic Flush requires a full body Radio Frequency therapy session. As a therapy technique, this procedure helps the body accelerate the removal of toxins and residual fat. For those who have utilized the Cavitation procedure for help in the removal of fat from the body, this procedure aids in that process. For those not having had additional procedures, this treatment aids in the body’s natural process of toxin release. This procedure is somewhat lengthy, usually requiring an hour or so for completion. The Lymphatic Flush includes work with both hands and arms as well as both feet and legs and the torso. This is a very relaxing treatment, much like a gentle massage. Highly focused Radio Frequency transducers are able to generate heat within the tissues of the muscle strands. In doing this, the transducer creates a sensation much like hot stone massage used therapeutically by massage therapists worldwide. The heat intensity is monitored and adjusted to provide maximum benefits. The Therapeutic Heat Treatment helps eliminate pain throughout the body including but not limited to the back, hips, knees, joints and shoulders. This treatment has been known to relieve pain associated with muscle strains and injuries. The whole body as well as the client’s state of mind can benefit from this deeply relaxing RF therapy.